Expensive rings should be protected on the honeymoon. For many couples, taking an engagement ring on the honeymoon is an obvious choice, but it should be considered carefully before packing potentially the bride's most expensive piece of jewelry along on any vacation, even one to celebrate the recent nuptials. Why Not Take the Engagement Ring on the Honeymoon? If the sizing isn't precise and the ring could accidentally slip off. 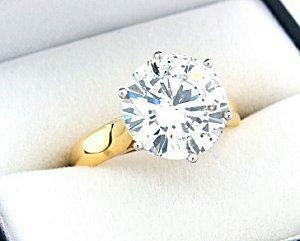 If the ring is an antique or irreplaceable heirloom that may be easily damaged. If the ring is exceptionally expensive and may become a target for theft. If a lot of outdoor or sporting activities are planned, such as hiking, snorkeling, diving, or other actions that could be hazardous to the ring. Choosing to take the ring along on the honeymoon is a personal decision, but it should be made not only with fashion and style in mind, but also with a sense of protecting the ring from loss, theft, or accidental damage. If you choose to take your engagement ring on the honeymoon, you need to do more than simply slip it on your finger before leaving. To keep the ring safe, you must properly provide for it and ensure that there is no confusion about its origins or value. In addition to packing the proper paperwork, you should also take along items needed to store the ring, such as the original velvet box or soft bag. Don't forget suitable jewelry cleaner, particularly because you may be unable to communicate the ring's specific characteristics vital to cleaning (treatments, for example) if you are traveling in a foreign country. If the ring may be left in a hotel room at any time, be sure to have an in-room safe or other means of securing the jewelry from possible theft. If you do decide to leave your engagement ring at home during your honeymoon, be sure to stow it in a secure location: a safe, a bank safety deposit box, or with a trusted friend or family member who will be able to safeguard it. Do not simply leave the ring in an unsecured jewelry box or out in the open where it might tempt thieves. There are several steps you can take to protect your engagement ring if you do take it on the honeymoon. Consider insuring the ring prior to the trip to safeguard against loss or damage. Keep copies of certification documents and sales receipts at home as well as with you during the trip in case your luggage is lost. Always pack the ring in carry-on bags if it isn't being worn; do not put expensive jewelry in checked luggage. Whenever it is not worn, place the ring in a safe or other secure location. A newlywed bride is naturally proud of her engagement and wedding rings, and showing off the rings during the honeymoon is a classic expression of that pride and the joy of being married. There are times, however, when it is not wise to take an expensive ring along on a honeymoon. If you do decide to pack the ring along with your other getaway gear, it should be protected against loss, theft, and damage, because there can be no more devastating beginning to a marriage than losing the symbol that started it all.